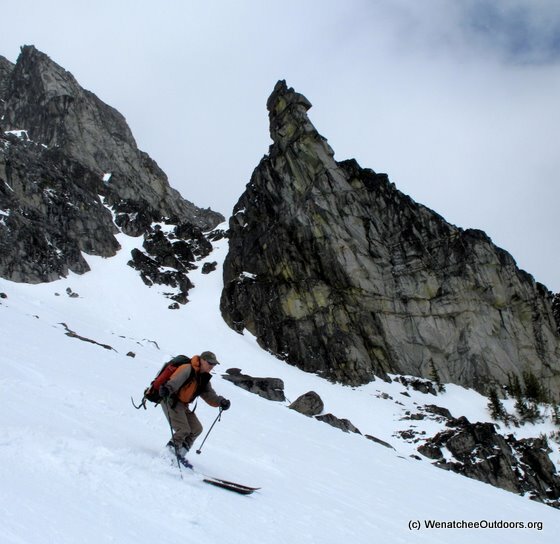 My nephew, Eric Smith, and I skied the Cascadian Couloir on Mt. Stuart on Saturday, June 4, 2011. Because it was forecasted to be so warm on Saturday, we left Wenatchee at 2 a.m., and hit the trail about 4:30 a.m. The Teanaway River road is in really good shape, but consistent as prior reports indicate, is blocked about a 1/2 mile from the Esmeralda Trailhead this year due to a snow slides that are unlikely to melt out for another 3 weeks.We went over Ingalls Pass rather than Longs Pass. We had an easy ski down the valley to the mouth of the Cascadian, including an easy crossing of Ingalls Creek on a snow bridge. Other skiers we encountered who went over Longs Pass and crossed Ingalls Creek down low struggled to cross the creek as it’s starting to roar right now. The Cascadian Couloir was hard snow early in the morning, and we used ice axes but not crampons. The snow softened when we hit the summit block as the sun had been on it for a few hours. We were able to skin from the top of the couloir well up onto the steep slopes of the summit block. We booted the last several hundred yards using ice axes for safety. The false summit was gorgeous as there were no clouds in the sky. There had been some fresh snow up there earlier in the week, and in the warm snow it was quite soft and sluffy. This snow was manageable, but is something to be wary of until it consolidates better. We did not cross over to the true summit because it was very steep snow and we had not packed crampons with us. There were ski tracks off the true summit, what hardy souls they must have been! Our own ski down Cascadian was relatively uneventful. The snow had warmed and softened and made for great turning. We returned to the car by traversing back up through Headlight Basin and over Ingalls Pass because 1) we did not like the looks of the cornice hanging over Longs Pass in the baking sun all day, and 2) we wanted an easier crossing of Ingalls Creek which is available higher up the valley. 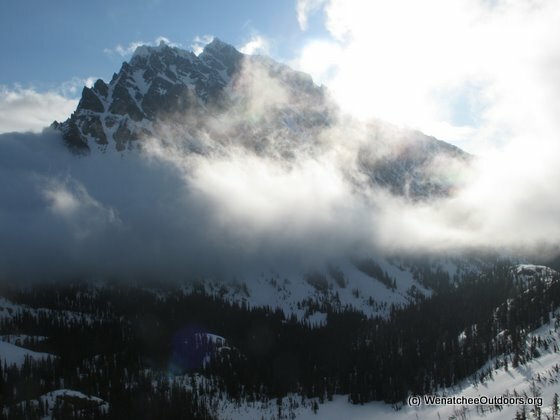 We lingered around Ingalls Pass for quite some time enjoying the warm weather, sunshine, and the absolutely spectacular views. There is a lot of snow up there to be skied that will last for another couple weeks. We were able to ski to within about 0.3 mile from the trailhead and got back to the car at about 8 p.m. This was a long but absolutely spectacular day. The last time I did Stuart on a climbing trip up the West Ridge I lost both toe nails from the long descent bringing you down the Cascadian Couloir. 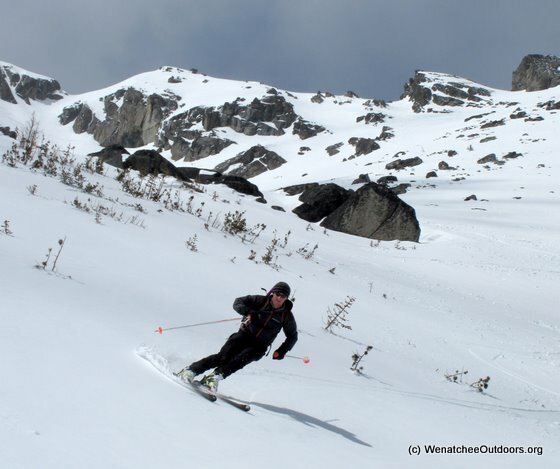 Skiing the 4,500 vertical is sooo much better! 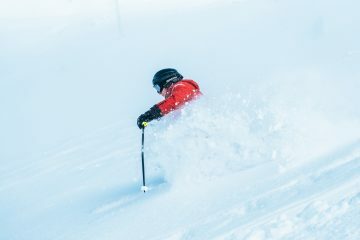 Conditions should still be good up there for another few weeks so skiers who are inclined to ski our highest local peak should get to it. Fitness: 3 (advanced) if done as overnight trip, 4 (expert) as a day trip. Climbing Cascadian Couloir. Mountaineers who climb the Cascadian Couloir in the summer rate the skill level needed at a 1+ (suited to advanced beginners). Depending on options taken up high, there may be steep snow to contend with (crampons and ice axe recommended) or some exposed 3rd class scrambling. Fitness required for climbing would be a 2+ (strong intermediate) if done as an overnight trip, and 3+ (strong advanced) if done as a day trip. Access. From the Big Y Junction east of Leavenworth, follow Highway 97 south over Blewett Pass. About 14 miles beyond Blewett Pass, veer right onto Highway 970 at its junction with Highway 97. Follow Highway 970 roughly 5 miles then turn right on the Teanaway Road. The Teanaway Road is paved for the first 13 miles. At the end of pavement, keep going straight, following the North Fork of the Teanaway along Road 9737. Follow Road 9737 about 9.5 miles until it ends at the Esmeralda Trailhead where the trails to Ingalls Lake and Longs Pass begin. Note: The last several miles of Road 9737 are usually not snow-free until mid to late May. For this ascent on June 4, 2011 the cars were parked about 0.5 miles from trailhead and the skiers surmised that, because of avalanche debris covering the road, it would be a few more weeks before you could drive all the way to trailhead. In 2007, the first weekend normal vehicles could reach the trailhead was the weekend of May 19-20. Trip Instructions. From the end of the drivable portion of the road, travel the road north to the Esmeralda Trailhead (4,290 feet). Head up the trail bordering the river for about a half mile, then climb in an easterly direction to either Longs Pass (6,210 feet) or in an easterly and then a northerly direction to Ingall’s Pass (about 6,500 feet). Long’s Pass is the more direct route and is described is more detail here because thee the trip report above describes doing the route from Ingalls Pass. From Longs Pass, follow the Ingalls drainage downhill (contouring at the 4,800-foot level to reach one of the two Cascadian ascent routes noted on our map. Depending on the gully system chosen ascend on a bearing of 348 degrees to either the Sherpa Col or to the false summit. 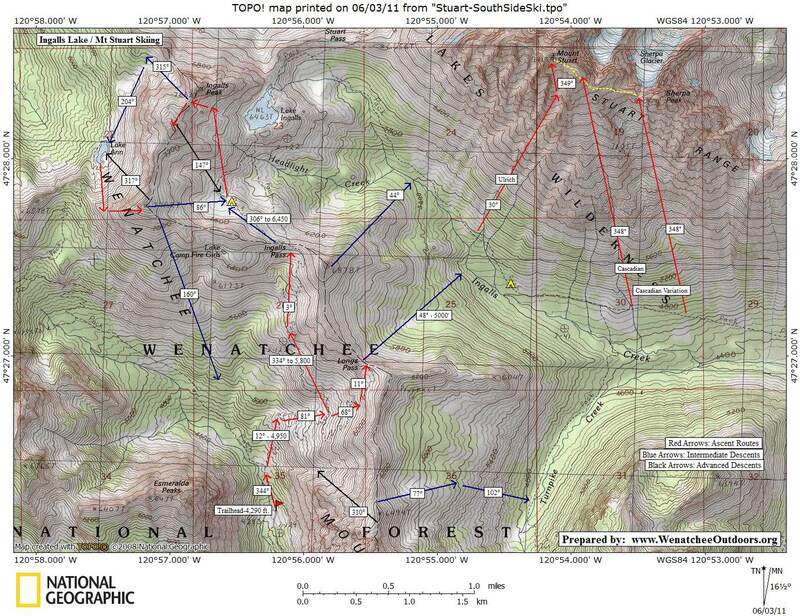 Then follow the summit ridge system in an north westerly direction to the true summit (9,415 feet). Hazards. 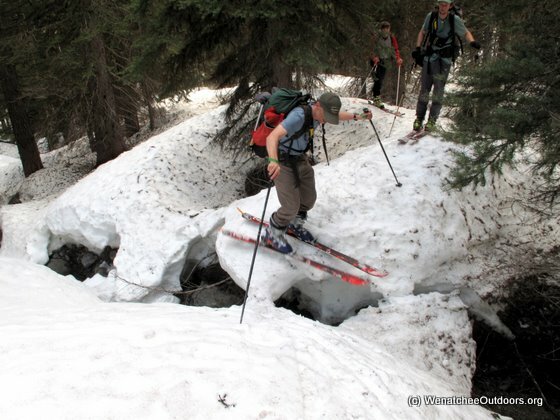 In winter and spring there is substantial hazards with both climbing and skiing this route. 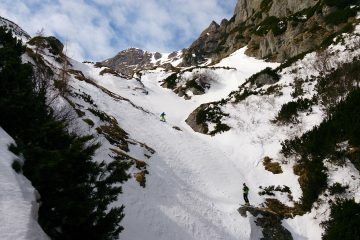 In firm conditions, falling on the upper portions of the route could easily result in a very dangerous slide. To complete the route safely, requires good conditions and good judgment. Equipment. 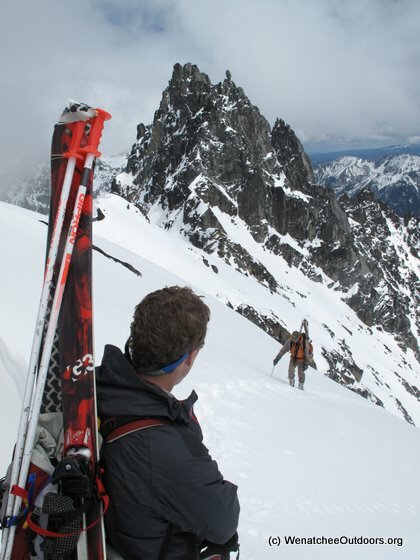 Besides the normal backcountry skiing kit,ski crampons, boot crampons, and an ice axe are all highly recommended. Uses Not Allowed. 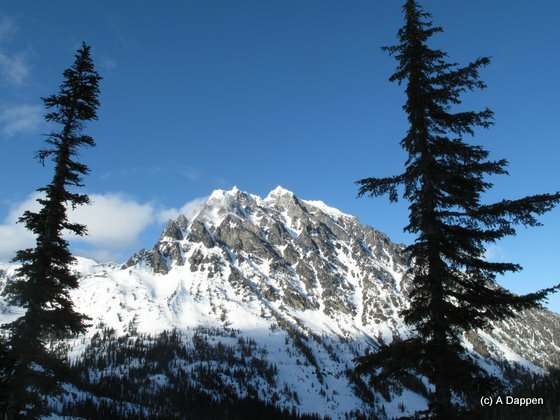 At both Longs Pass and Ingalls Pass you enter into the Alpine Lakes Wilderness. Snowmobiles are not allowed past here. Unfortunately, the area is not policed, is remote, and the tracks of snowmobiles are often seen in the wilderness. Fees / Permits. A Northwest Forest Pass is needed once the road is open to the Esmeralda Trailhead. As long as snow prohibits driving access to the trailhead, a permit is not required.